Just returned from another visit to Cozumel, Mexico, Island Dreams' owner Ken Knezick has prepared this report for you. By way of perspective, over the past 25 years, Ken has logged 300-400 hundred dives on the reefs of Cozumel, during the course of more than 50 separate trips to this very special, and much beloved island. Copyright © - Island Dreams, Inc. All rights reserved. Seasonality - Over the course of the year, many of Cozumel's hotels have four or five different rate tiers, changing by season. In general, summer is low season. In the winter, when it's snowing in New Jersey the rates go up! As you might imagine, non-holiday periods offer the best value. After Labor Day and before the Christmas holidays is an excellent time to visit. So is the spring, when rates go back down just after Easter. The weather is generally great, warm and pleasant, with calm sea conditions. But the real value of traveling at non-peak times is in the fact that rates are at their lowest, while tourism is light. The hotels have their best rooms available, and the restaurants and shops are happy to see you. So if you can swing the vacation days, try to visit at a non-holiday period. A Great Hotel - Fiesta Americana Cozumel Dive Resort - On my last few trips to Cozumel, I've stayed at the Fiesta Americana Cozumel Reef. This is an excellent 5-star hotel located about four miles south of town, close to the reefs of Santa Rosa, Palancar, Maracaibo, and all of Cozumel's best diving. Relative to its quality of accommodation and amenities, Fiesta Americana's rates prove to be very attractive. Each room is a spacious, mini suite with a balcony overlooking the ocean. They have three restaurants, two swimming pools, and a really nice beach club. But among my main reasons for selecting Fiesta Americana is that Juan Leca's Dive House is the in-house dive operator. I've come to realize that Dive House is unequivocally Cozumel's best diving service, fortuitously combined here with one of Cozumel's best hotel values. (More about Dive House later in this report). An important part of the fun of visiting Cozumel is in its delightful diversity of restaurants, shopping, bars, and exotic nightlife. You need not be deterred by Fiesta Americana's beachfront location, for Cozumel's taxis are plentiful and cheap. The fare from the Fiesta Americana's reef side location to the center of town (ask the taxi driver for "el centro") is only three or four bucks at current exchange rates. So you end up with the best of both worlds - you're on the beach, removed from the noise and commotion of downtown, while still enjoying easy access to all of Cozumel's endearing local charms. Juan Leca's Dive House - A Professional Dive Operation - From a scuba divers or snorkelers perspective, the best part about the Fiesta Americana Cozumel Dive Resort is the fact that Juan Leca's Dive House is the in-house water sports operator. Dive House offers superb boats and a well trained professional staff of PADI divemasters and instructors. While they also have a full service shop on the square downtown, Dive House's Fiesta Americana location starts close to the reef, so your boat rides are short, fast and comfortable. 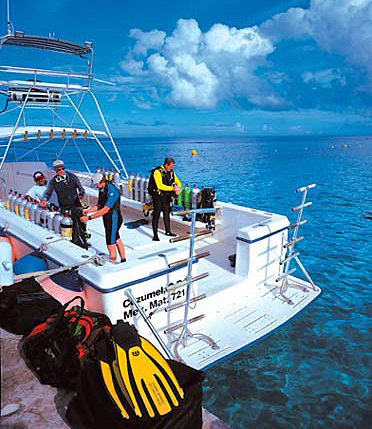 All dives are conducted to accommodate both dive computer and table divers. If you've not yet experienced the safety, and extended bottom times that a dive computer can provide, then this is a good place to start, as Dive House offers quality computer rentals. By the way, I again took the time to look over their supply of rental gear. In the "good old days" it was definitely inadvisable to rent equipment in Cozumel, but fortunately, times have changed. Dive House has a well-maintained supply of Scubapro buoyancy compensators and regulators, complete with safe second stage (octopus), and pressure/depth gauge console. Their boats are also excellent, very fast and efficient, with twin 375 horsepower diesel engines, toilet, first aid equipment, and DAN oxygen on board. As a result, Dive House and Fiesta Americana have qualified as a prestigious PADI Gold Palm 5-Star Resort, and a NAUI Dream Resort. They are also sanctioned by SSI, and TDI (Technical Diving International). So I suggest that you check out Dive House for yourself. I continue to be impressed by the owner, Sr. Juan Leca, and the professionalism and concern for safety, quality, and customer service evidenced by his entire operation. This is also a great place for scuba instruction. There are six instructors on staff, teaching PADI, NAUI, SSI, and TDI. They do referrals, complete openwater certifications, advanced courses, Nitrox, and even rebreather certification. The quality of instruction is excellent. EDP - Experienced Diver Program - Central to Dive House's operation is their Experienced Diver Program (EDP). With the EDP, Dive House will accommodate you on a custom dive boat, teamed up with fellow divers of equal skill level - New Diver, Intermediate, or Advanced. You'll be served by divemasters and crew trained to attend to your specific needs. Rest assured that you will come away from this experience a better, safer, and more comfortable diver. There is no extra charge for this excellent service. Dive House also offers a "Select Fast Boat" option. For $10 more per diver per day, you may opt to have your own boat and dive guide, with a maximum of only six divers onboard. You may choose where, when, and how you will dive. Experienced divers will appreciate this opportunity to be the first boat of the day to reach the more exotic dive sites. Perhaps even more importantly, new and beginner divers will benefit from the personalized service that only this type of operation can offer, as the dive is tailored to your particular needs rather than those of a larger group. In my opinion, it's definitely worth the small additional cost. Hotel Cozumel (formerly the Fiesta Inn) - Hotel Cozumel is my favorite medium range (3-star) property. It is located just across the street from the water, about a 15-minute walk from town. Hotel Cozumel is a large and attractive hotel built around a landscaped central courtyard with Cozumel's nicest swimming pool. There are a restaurant and bars on site, and a small but pleasant beach club out front. There is an in-house dive operator, Dive Paradise, while we can also arrange to have Dive House or Aqua Safari (another very professional dive operator) pick you up from the Costa Club pier. Scuba Club Cozumel (formerly the Galapago Inn) - I first stayed at the Galapago in 1978. It was a great situation then and still is. Now named Scuba Club Cozumel, it has sixty rooms, on the water, with an excellent in-house dive operation. While the rooms themselves are somewhat spare, the package includes all meals and is a very good value for divers on a moderate budget. Presidente Intercontinental Cozumel Resort & Spa - This is the finest (and priciest) hotel on Cozumel. The rooms are very nice, and the beach area is beautiful. Scuba-du, a good dive operation, is on-site. I treated my associates to a lovely lunch at the Presidente's big oceanside Palapa restaurant - one of the prettiest dining spots in Cozumel, or anywhere else. The food was good, the service impeccable, but then again, the lunch bill for three with just one drink apiece, came to USD $70. So...a good hotel for dieters who appreciate the finer things in life! Condos and Rental Homes - Island Dreams also represents a broad selection of condos and houses available for rent. For families, or large parties, this can be a wonderful way to enhance your Cozumel experience. Just let us know if you'd like more information about these options. Other Dive Operations - Cozumel now has more than 120 dive operations. Some are experts and very professional, while others can only be considered "fly by night" operations. As it is your personal well being at stake, be sure that you select an operation with the skills, equipment, knowledge, and depth of experience to serve you properly. In this category I would include the likes of Dive House, Aqua Safari, Scuba-du, Del Mar Aquatics, and Marine Sports, among others. By and large, pricing for a two-tank boat dive is uniform throughout Cozumel, but if you find a dive operation is attracting your attention by being cheaper that the rest, please consider that there is probably a (not so good) reason why. If an operator is able to charge $5 more per day than the rest in this competitive market, in most cases you will definitely get extra value for that small additional charge. An Overview of Cozumel's Diving - It's for good reason that divers flock from around the world to Cozumel, Mexico. The reefs here are unique in the entire world. A constant current brings nutrients up from the southern Caribbean. This current hits the tip of Cozumel and is forced between the island and the mainland of the Yucatan coast, a scant eight miles to the west. Over countless eons, this rich current has fostered the creation of immense coral reef structures, teaming with a wealth of vibrant marine life. The result for scuba divers is the opportunity to drift with this life giving current on an effortless and convoluted cruise along the steep walls and through the labyrinthine passages of reefs such as Maracaibo, Palancar Caves, Columbia, and Santa Rosa. I am fortunate to have seen more than my share of the world's best dive sites, throughout the Caribbean and the Pacific, from Little Cayman to Australia, the Red Sea , Palau, Borneo, and beyond. After all that, I still find Cozumel's wall dives unsurpassed for their sheer, imposing majesty. My beginner dive buddies appreciated the color and variety of coral, invertebrates and fish life on the shallow inner reefs like Yocab, Tormentos, and Paso de Cedral. Once they've experience it, divers keep coming back for more, specifically because Cozumel offers an easily accessible, and uniquely satisfying diving experience. Drift Diving - Just a quick note here. Beginners are often unnecessarily fearful of drift diving. After 50+ dive trips to Cozumel, all I can say is, "relax and go with the flow." There is simply no need to fight the current. If you want to slow down, just duck in behind an outcropping of the reef. You'll find that all the fish congregate in such eddies, so they don't have to work hard either. Basically you just drift along as part of the current, enjoy the sights, and on ascent, make your safety decompression stop while still drifting. You generally find that when you surface at the end of the dive, your dive boat is right there waiting for you. An important safety tip though: Don't surface directly behind the boat, where the Captain may not see you. The engines ARE running and may be engaged at any moment. Rather, surface ten or so yards away from the boat, be sure the Captain sees you, and then swim to the boat on the surface. Dining for Divers - While dedicated divers go to Cozumel for the value, variety and excitement of the scuba diving, even mossbacks like me are not immune to Cozumel's topside attractions. For starters, the dining options are unlimited, with choices for all tastes and budgets. Cozumel offers everything from fast food and fajitas, to superb gourmet restaurants with an excellent level of cuisine and topnotch service. Around town, good choices in ascending order of expense are El Moro, the Mission, Santiago's, La Choza, Ernesto's Fajitas, Joe's Place, the Coral Reefer, numerous interesting Italian restaurants, Prima Trattoria, Rolandi's, Pepe's Grill, Cafe del Puerto, and the excellent new wave cuisine of Gallito Sol. One of my all-time favorites is the rustically romantic Cabana del Pescador (the Fisherman's House). It's about two miles north of town, on the road along sea. All they serve is lobster - you select your tail and pay by its weight. Bring someone you love and give this place a try... by candlelight no less. Fans of Costa Brava take note, due the new International Pier constructed downtown they have been forced to move to a new location, after 15 years of serving many thousands of divers their morning coffee, $2.00 breakfasts, and $1.00 beers!! Here's another FYI. In previous reports, I've called your attention to the interesting and rustic restaurant that was located at the lighthouse at Punta Celarain on the southern tip of the island. Be advised that the road to the lighthouse has been closed, and the restaurant is no longer in business. Apparently they are preparing the area for some sort of future development. I for one will certainly miss that place. Party People - The party people amongst us have no doubt partaken of the wild-side pleasures of places like Carlos and Charlies, or the Hard Rock Cafe Cozumel, where the "fun" never stops. They've even added a Mayan version of Hooters, which I simply did not have the courage to visit. There are numerous other nightspots and dance clubs that don't even start cranking until 11:00 p.m. The action routinely continues until the dawn's early light. Tip: The in-crowd is currently patronizing a shadowy little joint called Joe's, featuring a great Cuban singer and her band. The disco Scaramouche is no longer in business, but if you want to dance, Neptuno is now the coolest discotheque in town. So knock you socks off and have a good time...just remember, no drinking and diving. It's great to bring your dancing shoes to Cozumel, but do get some rest before you put your dive booties back on. Remember to keep yourself well-hydrated on the dive boat with plenty of water...not cervezas. And most of all...watch out for those land sharks. They make the toothsome hammerheads in the ocean look good!! ttention Cozumel Shoppers - Others may prefer to partake of the prodigious shopping opportunities Cozumel offers. If you like silver jewelry, colorful clothing, a wealth of Mexican handicrafts, or just "five t-shirts for twenty dollars," you'll find yourself in shoppers' heaven as you stroll through street after street of "blue light specials." As the friendly storekeepers tout, "it's so cheap, it's almost free." I've always enjoyed a bit of haggling in the crowded shopping stalls of the Mercado de Artesanias (Artisans Market). But an expanding area of vehicle-free walking streets has sprouted up around the Town Square with scores of interesting shops to be investigated. While the steady stream of cruise ship traffic has cut into my success at bargaining, you can still have fun and shave a few pesos by haggling a bit over the price. If you don't offer half the originally quoted price, and end up compromising somewhere in the middle, you'll be leaving money on the table, while disappointing the sporting nature of the seller. Here's a savvy shopper's tip: Never ask "cuanto cuesta" (what does this cost? ), but rather casually inquire "cuanto vale este" (what is this worth?). The shopkeeper will immediately appreciate the difference. Have fun with it, and remember - you can always come back, or frequently find the same thing in another shop just down the street, so don't feel bad about saying "no gracias" and walking out the door. Cultural Opportunities - When you're not shopping, diving, dining, or dancing, Cozumel still has some special surprises in store for the intrepid traveler. For starters, there's wonderful live Mexican music everywhere, with groups of talented Mariachis entertaining in the restaurants and playing for tips in the street, as an excellent Ballet Folkloric Troupe performing the traditional dances of Mexico and the Caribbean. On weekend evenings there are often fiestas staged on the pavilion in the middle of the town square. These events are patronized by tourists and locals alike. You'll see Cozumel's children dressed in their Sunday best, and teenage girls making the traditional paseo around the square under the watchful eyes of their grandmothers. When the band starts to play, feel free to join in the dancing and revelry. You'll soon feel like a Cozumeleño yourself. Mayan Ruins - If you can take a day, or even an afternoon away from diving, the Mayan ruins around Cozumel are well worth the trip. With just a few spare hours and a short taxi ride you can visit the small but interesting San Gervasio ruins right on Cozumel Island. But if you have a full day to spare, I heartily recommend the trip over to the Mayan sites of Tulum on the Yucatan mainland. This tour crosses to Playa del Carmen by ferry and then continues with a 45 minute bus ride down the coast to the stunning Tulum Mayan religious site overlooking the sea. After exploring the ruins with an English speaking guide, you'll stop for lunch and a snorkel at Xel-Ha lagoon before returning to Cozumel in the evening. This tour can be easily arranged through your hotel and costs $35-40 per person. If you've already visited Tulum, and neighboring Coba, for about $90 you can take a full day tour that includes the flight to the extensive Mayan site Chitzen Itza. These cultural outings are truly fascinating, but you don't have to be an archeologist to enjoy them as you'll have plenty of opportunity to eat, drink and shop along the way. And they're equally valuable for your kids, who will have fun while getting an education without even realizing it. The Bottom Line is more than just Bottom Time - Cozumel has plenty to offer for divers, snorkelers, sun worshippers, and water sports enthusiasts. You'll also enjoy great dining, happening nightspots, fun shopping, and enlightening cultural opportunities. The people are friendly, and most everyone speaks English, though I encourage you to try out your Spanish. Even if you only know a few words, the effort will be appreciated. In the final analysis, Cozumel is close to the U.S., easy to get to, and just plain and simply good fun! So don't keep putting it off until manaña... Enjoy Cozumel! "Wishing you great diving, and a world of adventure..."
Island Dreams has dedicated color brochures, travel tips, magazine reprints, and detailed travel information about Cozumel and the Caribbean. You are invited to call or e-mail for additional information, advice, or assistance with resort bookings and special fares on Continental Airfares.